The popcorn carts of Disneyland Resort offer an excellent opportunity to find those magical details that make Disney special. We all expect the attractions to be immersive and chock-full of magic, but what sets Disney apart is their ability to theme the ordinary. Spend a whole day at a Disney theme park and you’re inevitably going to want snacks. From churros to Disney’s famed Dole Whips, there are snacks aplenty in all Disney parks. But sometimes you just want something simple, not too expensive, and good for your whole group. Popcorn fits those criteria quite nicely. Salted, buttery popcorn for only $4.50 in a standard open-top box (as of this writing) is easy to find at Disneyland and California Adventure. You can easily follow your nose to locate the popcorn carts of Disneyland Resort or use the official Disneyland App to find the popcorn cart nearest you. 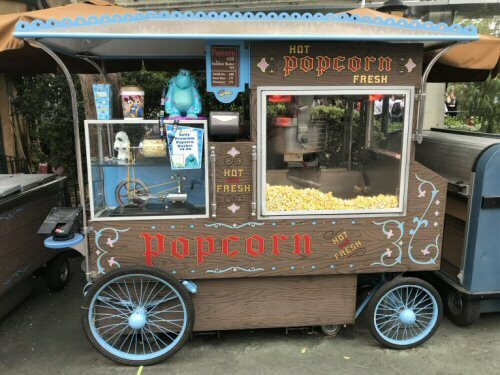 Most days there are 8 popcorn carts inside Disneyland and 3 inside Disney California Adventure. 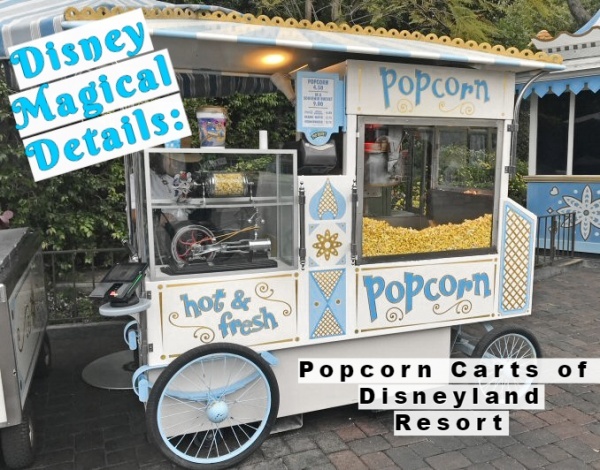 So what makes the popcorn carts of Disneyland Resort special? 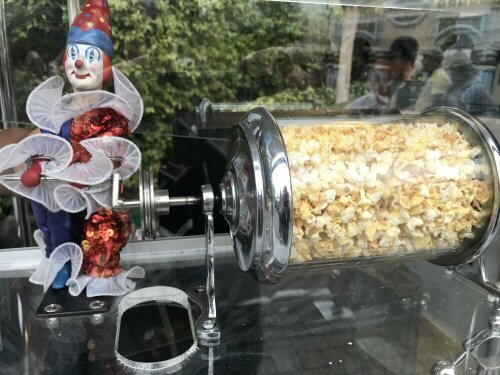 Look closely inside the small window and you’ll see a little figure tirelessly turning the popcorn for the guests; this figure will vary depending which land you are in. If you want to grab a box while waiting for the parade, there are 4 locations along the parade route to serve you. 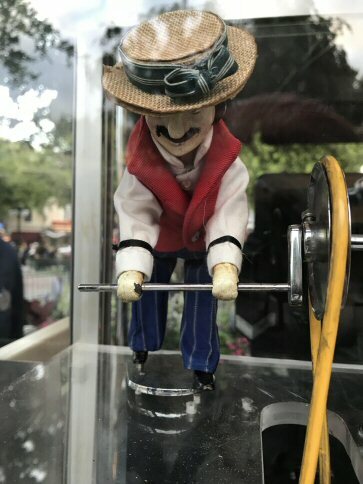 There’s a cart near City Hall on Main Street and this cart is operated by a straw hatted man sporting a full mustache who looks right at home on Main Street, USA. 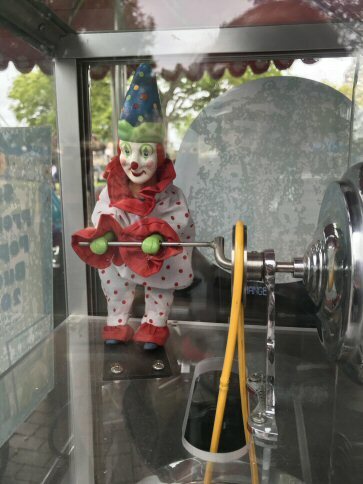 Further down the parade route near the Partner’s Statue, you’ll find a popcorn cart operated by a clown. You’ll find the clown’s counterpart at the popcorn cart near Fantasyland Theatre. 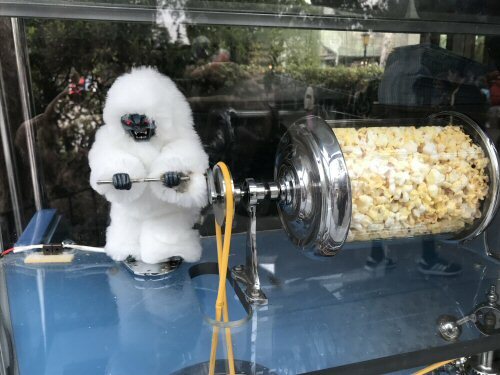 If the yeti inside the Matterhorn is too scary for you, go visit the yeti Harold in miniature at the popcorn cart near small world Promenade. This location is also conveniently located along the parade route. Mickey’s Toontown is a great place to play around and discover an abundance of magical details. 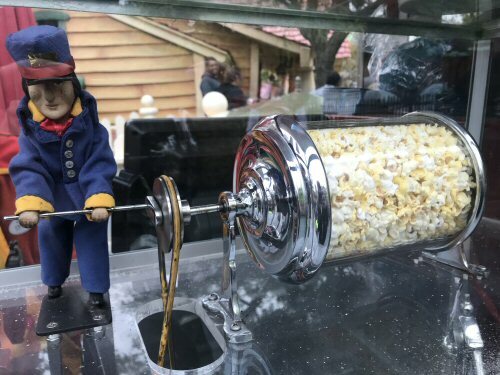 While you walk around and explore, grab some popcorn to munch and check out the little Toontown train conductor churning it out for you. Frontierland and New Orleans Square are home to my two favorite popcorn carts. 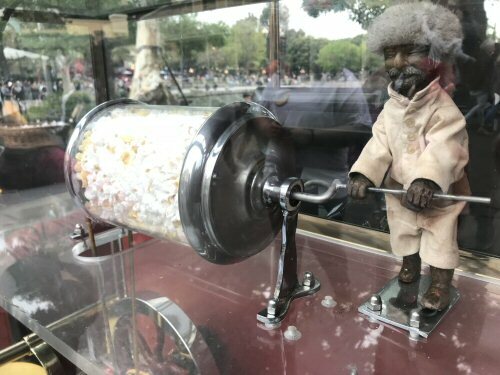 Near the dock of the Mark Twain and Colombia ships, you’ll find a popcorn cart with a little Davy Crockett; you’ll know him by his famed coonskin hat. 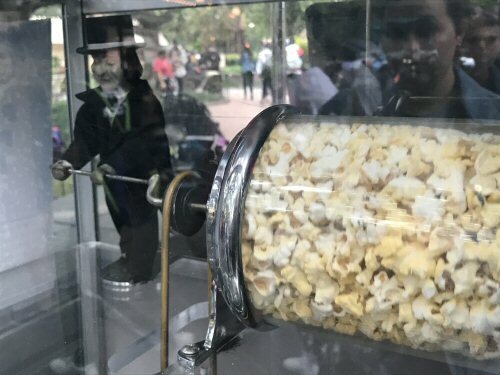 From there you can see the Haunted Mansion–head towards it and near the entrance gates is the popcorn cart with an undertaker churning that popcorn. Some of the carts change with the seasons so in the later months when Haunted Mansion Holiday has returned, you might catch Oogie Boogie at the popcorn helm. Our last two carts are a bit different in that they don’t have the same type of figures we’ve been highlighting. 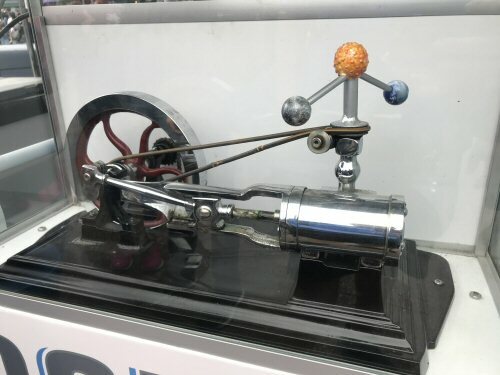 In Tomorrowland the popcorn cart pays homage to the Orbiter that watches over Tomorrowland. Over in Disney California Adventure at the Grizzly Peak Airfield, a propeller does popcorn duty. 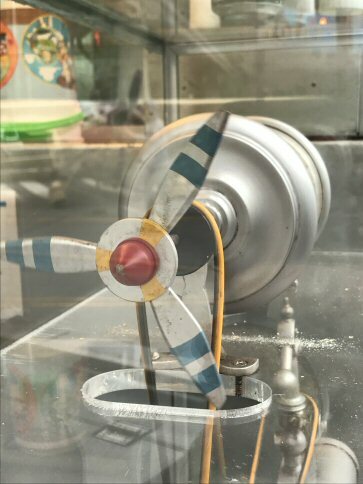 Next time you stop by one of the popcorn carts of Disneyland Resort, be sure and take a moment to appreciate the magical detail at your popcorn cart of choice. 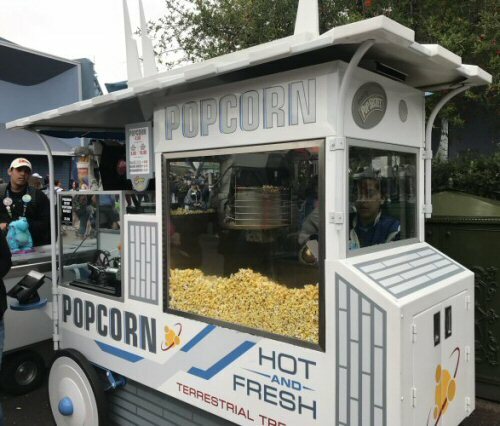 Which of the popcorn carts of Disneyland Resort is your favorite and why? Share in the comments, or on Facebook or Twitter. I'm Zandra, a SoCal native, and I grew up going to Disneyland once a year. Now I'm fortunate to go as often as once a week. I'm a homeschooling mom with one in college and one still at home. As a family we travel to Disney World every few years and have made 5 trips so far. We are also currently counting down to our 4th Disney Cruise. When I'm not being a wife or mom, I enjoy cooking, reading, and crocheting. Taking pictures in Disney parks may be my favorite activity, though.